The 2013 World Series was the championship series of Major League Baseball's (MLB) 2013 season. The 109th edition of the World Series, it was a best-of-seven playoff between the American League (AL) champion Boston Red Sox and the National League (NL) champion St. Louis Cardinals; the Red Sox won, 4 games to 2. The Red Sox had home field advantage for the series, based on the AL's win in the 2013 MLB All-Star Game on July 16. This was the first World Series since 1999 to feature both #1 seeds from the American League and National League. The Series started on Wednesday, October 23, ending on Game 6 the following Wednesday, October 30, 2013. The Red Sox won the first game at Fenway Park on October 23, followed by the Cardinals winning the second game on October 24 to tie the series 1–1. The series then moved to Busch Stadium, where the Cardinals won the third game on October 26 to gain a 2–1 lead. The Red Sox won the fourth game on October 27 to tie the series at 2–2, then won the last of three games at Busch Stadium on October 28 for a 3–2 lead. 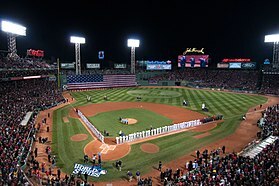 The series then moved back to Fenway Park, where the Red Sox decisively won the final game on October 30, becoming the World Series champions for 2013. This was the fourth meeting of the Cardinals and the Red Sox in the World Series (previously meeting in 1946, 1967, and 2004). Winning in six games, the Red Sox clinched their first World Series championship at their home field of Fenway Park since 1918, and the last such Series to date won by the home team. David Ortiz was awarded the World Series Most Valuable Player Award. He became the first non-Yankee to win three World Series titles with one team since Jim Palmer (Baltimore Orioles 1966, 1970, and 1983). The Cardinals finished the 2013 regular season at 97–65, earning the best record in the National League. They set a new Major League Baseball record for hitting efficiency with runners in scoring position, hitting .330 (447–for–1,355), the best in baseball since the Boston Red Sox hit .312 in 1950, also beating the 2007 Detroit Tigers, and 1996 Colorado Rockies with a .311 average. Despite losing first baseman Albert Pujols to the Angels and manager Tony La Russa to retirement, the Cardinals under new manager Mike Matheny still came within one game of a return trip to the World Series, but lost the final three games to the eventual World Series champion San Francisco Giants in the 2012 National League Championship Series. However, with the help of Matheny and general manager John Mozeliak, the Cardinals were able to stay in contention even with a roster consisting mostly of rookies, free-agent veteran additions, and a few holdovers from the 2011 World Series championship team. The Cardinals' offense was led by catcher Yadier Molina, second baseman Matt Carpenter, and first baseman Allen Craig, all of whom finished in the top 10 in batting average. They were joined by outfielders Carlos Beltrán and Matt Holliday, third baseman David Freese, and first baseman Matt Adams. The Cardinals' pitching staff were led by Adam Wainwright, who returned to form after posting an NL-leading 19 wins. Wainwright was joined by youngsters Lance Lynn, Joe Kelly, Shelby Miller, and late-season call-up Michael Wacha. Wainwright's return to form, along with the emergence of the young starters, helped fill the void left by star pitcher Chris Carpenter, who missed the entire season due to various injuries. The bullpen were also powered by youngsters, led by closer Trevor Rosenthal, set-up man Carlos Martínez, and middle relievers Seth Maness and Kevin Siegrist. St. Louis opened the playoffs by defeating the Pittsburgh Pirates in five games in the Division Series. Then, in their third consecutive National League Championship Series appearance, St. Louis defeated the Los Angeles Dodgers four games to two for their 19th National League pennant. After finishing last in the AL East with a 69–93 record in 2012, the Red Sox fired Bobby Valentine and hired John Farrell as their new manager. Under Farrell, the team finished the 2013 regular season at 97–65, the best record in the American League. In the aftermath of the infamous September collapse in 2011 and the ill-fated Valentine experiment of 2012, general manager Ben Cherington brought in Farrell, a former pitching coach under Terry Francona, and several role players in hopes of turning the Red Sox around. The Boston Marathon bombings on April 15 helped inspire a season-long rally for the Red Sox in support of the victims and the city of Boston. In games after the marathon, the Red Sox hung a jersey on the dugout saying Boston Strong and 617, representing the city's area code. The team also wore "B Strong" patches in their uniforms. In addition, some of the Red Sox players grew beards during the season as a sign of unity. The inspired play of the Red Sox took them from last place the previous season to American League East champions with a 28-game turnaround, helped by Farrell's calming presence and familiarity with some of the players. Boston's offense was powered by designated hitter David Ortiz, who hit .309 during the season. They also relied on the baserunning exploits of center fielder Jacoby Ellsbury, whose 52 stolen bases led the major leagues, while right fielder Shane Victorino, second baseman Dustin Pedroia, first baseman Mike Napoli, catcher Jarrod Saltalamacchia, and outfielder Jonny Gomes helped the Red Sox to a league-leading 853 runs scored. The pitching staff was led by Jon Lester, who rebounded from a miserable 2012 campaign to post a 15–8 record and 3.75 ERA. Lester was joined by Clay Buchholz, John Lackey and midseason acquisition Jake Peavy. The bullpen were led by closer Koji Uehara, who unexpectedly took over following injuries to Joel Hanrahan and Andrew Bailey to post 21 saves and a 1.09 ERA. He was joined by compatriot and set-up man Junichi Tazawa, and middle relievers Brandon Workman and Craig Breslow. While Stephen Drew and David Ross were limited offensively, their defense proved to be an asset to the team's success, especially during the postseason. Boston opened the playoffs by defeating the Tampa Bay Rays in four games in the Division Series. Then in the American League Championship Series, the Red Sox defeated the Detroit Tigers four games to two to win their 13th American League pennant. Boston won the series, 4–2. Boston Hall of Famer Carl Yastrzemski threw the ceremonial first pitch, as he had done before Game 1 in 2004 and 2007. After Boston starter Jon Lester pitched a scoreless top half of the first inning, St. Louis ace Adam Wainwright found trouble in the bottom of the inning. He walked leadoff batter Jacoby Ellsbury and after an out, Dustin Pedroia singled. Wainwright then got David Ortiz to ground to second base, but Matt Carpenter's flip was mishandled by shortstop Pete Kozma, ending the possibility of a double play. Initially, the Cardinals had been awarded a force-out at second base, but after conferring, the umpires ruled that Kozma never had control of the ball, and Pedroia was reinstated at second base. With the bases loaded and one out, Mike Napoli doubled to left-center, scoring Ellsbury, Pedroia and Ortiz, the latter after Shane Robinson misplayed a carom off the wall. In the bottom of the second inning, Stephen Drew led off with a pop-up in front of the pitcher's mound. Wainwright and catcher Yadier Molina both converged, but both let the ball drop for a leadoff single. David Ross then singled to center field, followed by a flyout by Ellsbury. Shane Victorino then hit a ground ball to deep short, but Kozma again mishandled it, his second error of the game, and once again the bases were loaded with one out. Pedroia then singled under the glove of a diving David Freese to make the score 4–0. Ortiz then hit a deep fly to right field, but was robbed of a grand slam by Carlos Beltrán. Ross did tag and score to give Boston a 5–0 lead. Beltrán would leave the game, with Robinson moving to right field, and Jon Jay taking over in center. Meanwhile, Lester was brilliant for the Red Sox, pitching 7 2/3 scoreless innings. The Red Sox added to their lead in the bottom of the seventh with Ortiz hitting a two-run home run off Kevin Siegrist to give them a 7–0 lead. After the Red Sox plated another run in the eighth inning, the Cardinals finally got on the board with Matt Holliday leading off the ninth with a home run off Ryan Dempster. Dempster recovered and closed out the 8–1 victory by striking out Matt Adams. Lester was accused of using a foreign substance on his glove, but he claimed that it was just rosin, which is legal, and the Cardinals organization elected to not file a complaint. Game 2 pitted the NLCS MVP Michael Wacha against the Red Sox' John Lackey. Several members of the 2004 Red Sox championship team, including Pedro Martínez, threw ceremonial first pitches. After three scoreless innings, Matt Holliday led off the fourth inning for the Cardinals with a triple to center field. After Matt Adams lined out, catcher Yadier Molina grounded out softly to Dustin Pedroia to score Holliday and give the Cardinals a 1–0 lead. The Red Sox threatened in the bottom half as the first two batters reached with Pedroia leading off with a double and David Ortiz drawing a walk. Mike Napoli then grounded into a double play to partially kill the threat and Wacha got Jonny Gomes to pop out to Matt Carpenter to end the inning. In the bottom of the sixth inning, the Red Sox finally got on the scoreboard, as Pedroia walked with one out and Ortiz hit a two-run home run to left center field on a 3–2 changeup to give the Red Sox a 2–1 lead. In the seventh inning, the Red Sox' defense let them down. With one out and the bases loaded (David Freese walked, Jon Jay singled and Daniel Descalso walked), Carpenter hit a fly ball to Gomes in left field for the second out. With Pete Kozma, who pinch-ran for Freese, scoring on the throw, the ball got away from catcher Jarrod Saltalamacchia. Jay and Descalso attempted to advance on the misplay and pitcher Craig Breslow, who was backing up on the play, tried to get Jay at third but his throw was wild and went into the stands. Jay scored and Descalsco went to third as the Cardinals now led 3–2. Carlos Beltrán then singled to right to score Descalso and give the Cardinals a 4–2 lead. Things got a little interesting in the bottom of the eighth inning. With Carlos Martinez on the mound for the Cardinals, the Red Sox had Jacoby Ellsbury reach on an error and after two strikeouts, Ortiz reached on a single. With two outs, Martinez jammed Napoli and he popped out to short to end the inning. In the bottom of the ninth with the 4–2 lead, Cardinals closer Trevor Rosenthal entered the game and made quick work of the Red Sox by striking out Gomes, Saltalamacchia and pinch-hitter Daniel Nava on 17 pitches. The Cardinals evened up the series at one game each as the series shifted to St. Louis for the next three games. With the win, St. Louis snapped Boston's nine-game winning streak in the World Series. The ceremonial first pitch was thrown by 1985 NL MVP Willie McGee. The Cardinals got off to a good start in the bottom of the first inning, putting two on the board from RBI singles by Matt Holliday and Yadier Molina off of Boston starter Jake Peavy. It wasn't until the top of the fifth inning before the Red Sox got on the board themselves, when pinch hitter Mike Carp grounded into a fielder's choice off Cardinals starter Joe Kelly. In the next inning, Boston tied the game at 2–2 on a Daniel Nava single. But in the bottom of the seventh, Matt Holliday hit a line drive off of reliever Junichi Tazawa that just got past a diving Xander Bogaerts that drove in two, and Holliday advanced to third on the throw. Even though this happened with no outs, Holliday was stranded at third. Boston quickly responded in the top of the eighth by loading the bases off Carlos Martínez. Trevor Rosenthal came in to pitch, and the first batter he faced, Daniel Nava, grounded in to a fielder's choice, after a great diving stop by rookie second baseman Kolten Wong. The next batter, Xander Bogaerts, bounced a ball up the middle for an RBI single of his own, knotting the game at 4–4. In the bottom of the ninth inning, Boston reliever Brandon Workman stayed in, having pitched in the eighth inning and having batted in the top of the ninth, striking out in his first professional at bat. He gave up a one out single to Molina. Boston closer Koji Uehara was brought in to face pinch hitter Allen Craig, who doubled on the first pitch. With one out, Jon Jay hit a grounder to second baseman Dustin Pedroia. He made a diving stab and threw home to catcher Jarrod Saltalamacchia, who tagged out the sliding Molina. But then Saltalamacchia threw to third trying to get Craig, who was running on the play. Saltalamacchia's throw was wide, and it pulled Middlebrooks toward the second-base side of the bag. Middlebrooks tried to keep the ball on the infield, but it skipped into foul territory. Craig slid into third, popped up and started for home. He made contact with Middlebrooks, who was lying face-first on the dirt, with his feet in the air. Craig fell, got back up and ran home. Saltalamacchia, receiving the throw from foul territory, applied the tag to the sliding Craig. However, the third base umpire, Jim Joyce, called obstruction on the play; home plate umpire Dana DeMuth determined that Craig would have scored without the obstruction, giving the Cardinals the win and a 2–1 lead in the World Series. The Red Sox were furious about the call, as manager John Farrell stayed out to argue the call, as did most of the players. They protested that Middlebrooks' feet were in the air as he was getting up when Craig ran over him. The largest paid crowd in the history of Busch Stadium (47,432) saw the game. It was the first time in a World Series game that a winning play was on an obstruction call. The largest paid crowd in the history of Busch Stadium (47,469) saw the game, surpassing the previous night's record attendance. Hall of Famer and two-time World Series MVP Bob Gibson threw the ceremonial first pitch. After Boston starter Clay Buchholz, pitching through a shoulder injury, was removed for a pinch-hitter after four innings, five Red Sox relievers combined to hold St. Louis to one run on three hits the rest of the way. In the sixth inning, the bases were empty with two outs before Dustin Pedroia singled and David Ortiz walked. Then, outfielder Jonny Gomes came to bat and the Cardinals brought in Seth Maness to face him. Gomes worked the count to 2–2 before he broke the tie with a three-run homer that would become the difference in the game. The game ended when Boston closer Koji Uehara picked off pinch runner Kolten Wong with Carlos Beltrán at the plate, making it the first postseason game in baseball history to end on a pickoff. Felix Doubront pitched 2⅔ innings out of the bullpen to earn his first career postseason win. John Lackey, who pitched a scoreless eighth, made his first relief appearance since 2004 and first in the postseason since 2002. Hall of Fame inductee Ozzie Smith threw the ceremonial first pitch. In a rematch of the staff who faced off in Game 1, Jon Lester again outdueled Adam Wainwright to give the Red Sox a 3–2 series lead. Boston scored first for the first time since Game 1 when Dustin Pedroia and David Ortiz hit back-to-back doubles with one out in the first. Matt Holliday tied the score with a home run to center in the fourth inning, but it would be the only run Lester would allow over strong 7⅔ innings of work. Wainwright matched Lester until the seventh inning, when a ground-rule RBI double by David Ross and RBI single by Jacoby Ellsbury scored Xander Bogaerts and Stephen Drew to give Boston a 3–1 lead. Koji Uehara relieved Lester with two outs in the eighth and retired all four Cardinals he faced to earn his second save of the series. Uehara tied John Wetteland, Robb Nen, Troy Percival, and Brad Lidge for most saves in one postseason year, with 7 (since then, Greg Holland matched this record the next year). In addition, Lester joined Babe Ruth as the only Red Sox lefthanders to win three World Series games. Boston Red Sox Hall of Fame members Carlton Fisk and Luis Tiant, both of whom played in historic Game 6 of the 1975 World Series, threw ceremonial first pitches. Boston won Game 6 in a rout, by scoring six runs on the Cardinals rookie Michael Wacha, who had previously been unbeaten in the playoffs. World Series Most Valuable Player David Ortiz was walked by the Cardinals four times, and scored twice. Boston's Shane Victorino opened the scoring with a three-run double in the third inning and had four runs batted in. Red Sox pitcher John Lackey pitched six scoreless innings. The Cardinals only seriously threatened in the seventh inning when they scored on Carlos Beltrán's single and had the bases loaded with two outs, but Boston reliever Junichi Tazawa got the final out. Koji Uehara came in again to pitch a perfect ninth, striking out Matt Carpenter swinging to end the game, series, baseball season, and clinch their eighth overall title. With this win, Boston won the championship at Fenway Park for the first time since 1918. The win was the third championship in the last ten seasons for the Red Sox. The average list price on the resale market for a ticket to Game 6 was $1,860, according to TiqIQ, a ticket tracking company. As of the 2018 postseason, this is the most recent World Series in which the home team has won a deciding game and has received the Commissioner's Trophy on their home field. Fox televised the series in the United States and Canada, with Joe Buck calling play-by-play and Tim McCarver handling color commentary. This was McCarver's 24th and final World Series broadcast (including four with ABC and four with CBS prior to his joining Fox in 1996), as he had announced that he would retire from the network's lead crew following the season. Working with Buck and McCarver were field reporters Ken Rosenthal and Erin Andrews. Pregame coverage was handled by host Matt Vasgersian, joined by regular analyst Harold Reynolds. They were joined by special guest analysts A. J. Pierzynski of the Texas Rangers (his third consecutive World Series as a guest analyst), and Jimmy Rollins of the Philadelphia Phillies. A partnership with Fox Sports featured Pearl Jam as the November artist of month for all entities within the Fox Sports domain and licensed 48 songs from their catalogue to play during the 2013 World Series. The group's music was included in anything from "opening teases and commercial bumpers to montages, as well as additional promotional inventory across Fox prime-time and cable." Major League Baseball International syndicated the television coverage outside Canada and the U.S., with English-language commentary provided by Baltimore Orioles play-by-play announcer Gary Thorne and ESPN analyst Rick Sutcliffe. According to Nielsen Media Research, the six-game series on Fox averaged an 8.9 rating and 15 share. The 8.9 rating was, by a large margin, the lowest for a six-game World Series (the 2009 World Series that pulled an 11.7 was the prior lowest) and the fourth lowest overall, behind the 2010, 2008 and 2012 series (the latter holding the record low at 7.6). 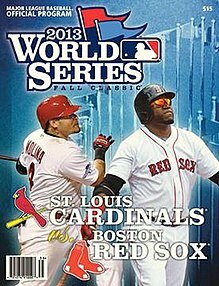 Game 3, which pulled a 7.4 rating, is the fourth lowest rated MLB World Series game, ahead of just Game 3 of the 2011 World Series (6.6), Game 3 of the 2012 World Series (6.1), and Game 3 of the 2008 World Series (6.1). Some analysts expressed alarm at the low ratings, considering the prestigious franchises involved (a combined 20 World Championships and 32 pennants). Boston, moreover, had a storybook narrative because of the recent Boston Marathon bombing, which, some felt, should have attracted casual audiences. ESPN Radio broadcast the series in the U.S., with commentators Dan Shulman and Orel Hershiser. Locally, the two teams' flagship radio stations broadcast the series with their respective announcing crews. Mike Shannon and John Rooney called the games for the Cardinals on KMOX in St. Louis, while Joe Castiglione, Dave O'Brien, and Lou Merloni announced for the Red Sox on WEEI in Boston. Boston failed to maintain the momentum of their World Series championship in the following year, falling back to last place in the American League East with a 71–91 record. This marked the third time in four years that a defending World Series champion failed to make the postseason. Boston returned to the World Series in 2018 and won their 9th title by defeating the Los Angeles Dodgers 4 games to 1. The Cardinals extended their postseason streak to a fourth consecutive season, winning the National League Central title for a second straight year with a 90–72 mark. They also made the NLCS for the fourth time in as many seasons, but like in 2012, they lost to the eventual World Series champions San Francisco Giants, this time in five games. All quotes are from Joe Buck unless otherwise noted. It hasn't happened at Fenway Park for 95 years! The Red Sox are world champions! BOSTON IS STRONGER THAN EVER! The Red Sox, are the World Series champions! ^ "2013 World Series". Baseball-Reference. Retrieved January 7, 2014. ^ Rymer, Zachary D. (July 16, 2013). "Is the All-Star Game awarding home-field advantage changing the World Series?". Bleacher Report. Retrieved October 17, 2013. ^ "World Series preview: Cardinals have just enough to beat Red Sox". Sports Illustrated. October 21, 2013. Retrieved October 22, 2013. ^ "Boston Red Sox: Can baseball side turn trauma into triumph?". BBC Sport. October 23, 2013. Retrieved October 23, 2013. ^ "Red Sox get special win in their special ballpark". Los Angeles Times. October 31, 2013. Retrieved October 31, 2013. ^ "Red Sox throttle Cardinals to win third World Series in 10 years". CBS Sports. October 31, 2013. Retrieved October 31, 2013. ^ "Red Sox Rout Cardinals to Win World Series". New York Times. October 31, 2013. Retrieved October 31, 2013. ^ "David Ortiz slugs way to MVP". ESPN. October 31, 2013. Retrieved October 31, 2013. ^ "Most Valuable Papi: David Ortiz named 2013 World Series MVP". Sports Illustrated. October 31, 2013. Retrieved November 1, 2013. ^ "Craig hopes to give Cards boost in the clutch: Out of action since Sept. 4, first baseman to DH in Games 1 and 2". MLB.com. October 22, 2013. ^ "Cardinals set new RISP mark". MLB.com. September 29, 2013. ^ "Cardinals knock out Clayton Kershaw, Dodgers, advance to World Series". Foxsports.com. October 19, 2013. Retrieved December 22, 2013. ^ Browne, Ian (October 21, 2012). "Farrell named the next Red Sox manager". RedSox.com. Retrieved February 4, 2013. ^ "2013 American League Final Standings". Baseball Reference. Retrieved November 18, 2013. ^ "2012 MLB Regular Season Standings - Major League Baseball - ESPN". ESPN.com. Retrieved December 21, 2013. ^ "Boxscore:St. Louis vs. Boston – October 23, 2013". MLB.com. October 23, 2013. Retrieved October 23, 2013. ^ "Boxscore:St. Louis vs. Boston – October 24, 2013". MLB.com. October 24, 2013. Retrieved October 24, 2013. ^ "Boxscore:Boston vs. St. Louis – October 26, 2013". MLB.com. October 26, 2013. Retrieved October 26, 2013. ^ "Boxscore:Boston vs. St. Louis – October 27, 2013". MLB.com. October 27, 2013. Retrieved October 27, 2013. ^ "Boxscore:Boston vs. St. Louis – October 28, 2013". MLB.com. October 28, 2013. Retrieved October 28, 2013. ^ "Boxscore:St. Louis vs. Boston – October 30, 2013". MLB.com. October 30, 2013. Retrieved October 30, 2013. ^ "World Series Game 1: St. Louis Cardinals Vs. Boston Red Sox". Getty Images. October 23, 2013. Retrieved October 21, 2018. ^ "Precision tools: Lester's gem, fast start power rout". MLB.com. October 23, 2013. Retrieved October 24, 2013. ^ "Red Sox rout: Cardinals get 'wake-up call' in Game 1". USA Today. October 23, 2013. Retrieved October 24, 2013. ^ "Red Sox cruise past sloppy Cardinals in Game 1 of World Series". ESPN. October 23, 2013. Retrieved October 24, 2013. ^ "Red Sox pitcher Lester accused of foreign substance on glove during World Series game". Fox Sports. Retrieved October 24, 2013. ^ a b c d e "2013 World Series pictures". Fox Sports. October 20, 2016. Retrieved October 21, 2018. ^ "Cardinals take Game 3 of World Series on obstruction call". ESPN. October 26, 2013. Retrieved October 29, 2013. ^ "St. Louis Cardinals 5, Boston Red Sox 4". Retrosheet. October 26, 2013. Retrieved October 21, 2018. ^ "2013 World Series – Intent not needed to make obstruction call, umpires say – ESPN". Espn.go.com. January 1, 2008. Retrieved October 28, 2013. ^ "Cards pull out wild Game 3 on first WS game-ending stunning obstruction call". CBS Sports. October 27, 2013. Retrieved October 27, 2013. ^ "Gomes homer, game-ending pickoff help Red Sox even World Series". Fox News. October 28, 2013. Retrieved October 28, 2013. ^ "Red Sox knot World Series on Jonny Gomes' three-run HR". ESPN. October 27, 2013. Retrieved October 29, 2013. ^ "Lester, Red Sox beat Cards, lead World Series 3–2". Boston.com. October 28, 2013. Retrieved October 29, 2013. ^ "Boston Red Sox lead St Louis Cardinals 73–2". BBC Sport. October 28, 2013. Retrieved October 29, 2013. ^ "Red Sox one win from World Series title". USA Today. October 28, 2013. Retrieved October 29, 2013. ^ "Jon Lester's gem in Game 5 puts Red Sox one win from title". ESPN. October 28, 2013. Retrieved October 29, 2013. ^ "One Win Away and Headed for Home". New York Times. October 28, 2013. Retrieved October 29, 2013. ^ "One win from Fenway fireworks". ESPN. October 29, 2013. Retrieved October 29, 2013. ^ Doyle, Ricky (October 29, 2013). "Boston's 'House of Pain' on Verge of Hosting Biggest Party Since 1918 and Other Notes From Game 5 of World Series". NESN. Retrieved October 30, 2013. ^ a b WALDSTEIN, David. "Red Sox Rout Cardinals to Win World Series". New York Times. Retrieved November 1, 2013. ^ "Red Sox win WS title, beat Cards 6-1 in Game 6". Yahoo News. Retrieved November 1, 2013. ^ "ESPN game six box score". ESPN.com. Retrieved November 1, 2013. ^ "Boston Red Sox hope to win championship at Fenway Park for 1st time since 1918". Fox News. October 30, 2013. Retrieved October 30, 2013. ^ "Red Sox haven't clinched title at home since 1918". USA Today. October 30, 2013. Retrieved October 30, 2013. ^ "Cardinals-Red Sox Preview". ESPN. October 30, 2013. Retrieved October 30, 2013. ^ "Red Sox close out Cardinals in Game 6, clinch title at Fenway Park". ESPN. October 30, 2013. Retrieved October 31, 2013. ^ "Boston Red Sox win the World Series – as it happened". Guardian UK. October 31, 2013. Retrieved November 1, 2013. ^ "Boston Red Sox beat St Louis Cardinals". BBC Sport. October 31, 2013. Retrieved November 1, 2013. ^ "Record prices for Game 6 tickets". ESPN. October 30, 2013. Retrieved October 30, 2013. ^ "Boston's moment of a lifetime". ESPN. October 30, 2013. Retrieved October 31, 2013. ^ Goold, Derrick (November 21, 2013). "Playoff shares announced for Cardinals, Red Sox". St. Louis Post-Dispatch. Retrieved November 21, 2013. ^ "MLB Analyst Tim McCarver to retire after 2013 season". WCBS-TV. Associated Press. March 27, 2013. Retrieved October 16, 2013. ^ "FOX Sports Announces Coverage of Major League Baseball World Series". BroadwayWorld.com. October 23, 2013. Retrieved October 31, 2013. ^ Hampp, Andrew; Letkemann, Jessica (October 11, 2013). "Pearl Jam to soundtrack the World Series (exclusive)". Billboard. Retrieved October 17, 2013. ^ Lariviere, David. "Low World Series TV Ratings (Again) Here To Stay Unless Changes Are Made". ^ "Boston fans converge on bombing site". Fox Sports. October 31, 2013. Retrieved November 1, 2013. ^ "Red Sox to be honored Saturday". ESPN. October 31, 2013. Retrieved November 1, 2013. ^ "Boston celebrates World Series win". ESPN. October 31, 2013. Retrieved November 1, 2013. ^ "Red Sox fans flock to Fenway, Marathon finish line". Boston Globe. October 31, 2013. Retrieved November 1, 2013. ^ "World Series: Red Sox, fans carry celebration long past the final out". Washington Times. October 31, 2013. Retrieved November 1, 2013. ^ "Red Sox in 'rolling rally' to celebrate". ESPN. November 2, 2013. Retrieved November 4, 2013. ^ "Boston Red Sox Parade 2013: Route, Date, Time, Live Stream and TV Info". Bleacherreport. November 2, 2013. Retrieved November 4, 2013. ^ "Best Moments from Boston Red Sox's 2013 World Series Parade Celebration". Bleacherreport. November 2, 2013. Retrieved November 4, 2013. ^ "Red Sox fans have a day to rejoice and remember". The Boston Globe. November 2, 2013. Retrieved November 4, 2013. Wikimedia Commons has media related to 2013 World Series. This page was last edited on 1 March 2019, at 09:03 (UTC).